Home » Your choice: Do you believe in this “bone” that Yellen is throwing us? Your choice: Do you believe in this “bone” that Yellen is throwing us? Gold remains well into buying opportunity range as of the close of last week, ending at $1277.25 per ounce. And there’s plenty of optimism out there for a bounce in the coming weeks, especially after more analysis of the Federal Reserve’s Jackson Hole symposium comes in. What have we learned from the Jackson Hole meeting so far? Not a lot. The impassioned and emotional speeches from Fed Chair Janet Yellen on the plight of the unemployed veered into embarrassing territory, as noted here in this CNNMoney clip. (When you watch the video, note the appropriately added soft fuzzy lighting effect and piano music.) It’s rather cringe-worthy, actually, for someone in such a powerful position, to be focusing so much on emotion when they should be concentrating on policy. Also interesting was the notable absence of Wall Street economists in favor of Big Labor economists. And, of course, Russia’s central banking figurehead was a last minute absentee. 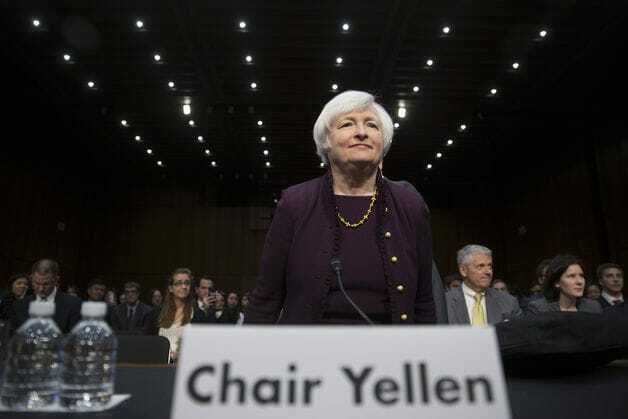 So there seem to be fewer seats at Janet Yellen’s table at the Fed, and they are being filled by different people. We are still learning what that means for policy from the world’s most influential central bank. Does this inspire confidence in you? Is this headed in a positive direction for our economic system? In our dollar? If you believe in the status quo, in the way things are done today, in central control and inflation of the dollar, in the rising debt, in the Federal Reserve, then perhaps it makes sense for you to stay the course with your savings. Stay in paper – stocks, bonds, mutual funds and the like. However, if you believe our country needs bold, courageous change that we’re not getting, and that the dollar is actually losing value every day, that prices are skyrocketing, that the administration’s spending is neither slowing nor sustainable – then you need to protect your portfolio with a bulwark of gold.